As a child-free adult in the U.S., I used to throw parties at my house on a regular basis. In part, it was an excuse to get the whole house clean for at least a few hours. It was a reason to cook up some food to share- a double batch of 3 or 4 little dishes or casseroles, and when that ran out, that was that. It was an excuse to go check out the beers on clearance at Scheller’s liquor store or try out a new cocktail recipe. And most of all, it was a reason to get together with friends, relax and be silly. Sometimes my roommates and I would throw theme-parties or dress-up parties- like the 80s party, the drag party, the princess party, zombie prom, fancy cocktail hour, to name a few. Sometimes we called it a celebration of the season- the “time to take the plastic off the windows for spring” party or the “summer solstice / come sweat your pants off” party or the “we turned the heat up two degrees for you guys” party. Sometimes we had big potlucks, occasionally with a regional theme- Slavic dishes, or South American. Sometimes it had just been a few months since I’d had a party and I needed to clean my house and go on a cooking spree. There was usually dancing, and good conversation, and cards and / or dice and potentially other games (the occasional chess board, or sometimes a drinking game). Having a party was medicinal for my soul, despite all the prep work and all the clean-up afterwards (maybe that was good for me, too, somehow). I loved it when lots of folks would stay the night (too drunk to drive) and I’d wake up and make chilaquiles or some other hangover food and strong coffee. These parties, whether there were 7 people or 47 popping in and out of the house, were a big piece of joy in my life. They are one of the things that I miss the most about my life in the U.S., and my life before Lucia. In our 2 and a half years here so far, I’ve neither been to nor had a party anything like this. Not to say that people don’t party. In fact, parties here are supposedly more frequent than in any other Latin American country (or so my Spanish book said back in university). There are parties for all things Catholic, like you could never imagine. There’s the day for the Virgin of Guadalupe, the Virgin of Juquila, the Virgin of who-knows-what-else, even though it’s all the same Mary essentially. There are parties for a saint that a neighborhood is named after. Even in the barrio de Jesus (the neighborhood named after Jesus), they figured out how to make it another day of celebration in early January by calling it “Tata Chu,” the chatina (regional indigenous language) way of saying “heart of Jesus.” There are parties to celebrate the town (in Puerto Escondido there’s a whole month’s worth of activities and festivities to celebrate in November), parties for political reasons, parties to celebrate Mexico (Flag Day, Independence Day, the start of the Revolution, and much more), not to mention other events and private parties. So there is plenty of celebration happening here; that can’t be disputed. Celebrations here, for me, however, are not places to let loose and be silly and chat with lots of folks. It is fine for men (and sometimes women) to get drunk, so maybe that’s fun for them. And some people manage to let loose by dancing with a million people all night long, and they certainly look like they’re having fun. But it does not give me the kind of social interaction I crave from parties. Maybe it’s just because I’m a foreigner, but there never seems to be any good conversation happening if you are not magically sitting at a table with interesting folks you already like or know. People don’t just walk around and mingle. The only way to get up and do anything is to dance, so hopefully you like the music. There are definitely no games, unless it’s a kid party (and then it’s mostly just breaking open piñatas). As a guest at parties, I always feel like I’m just sitting awkwardly at the table waiting to be served, staring at strangers and getting stared at. Parties here are (by my standards) outrageously large and lavish affairs that I never, ever want to try to produce. We were just at a wedding, for instance, where we didn’t even know the bride or groom. Conan is good friends with the padrinos of the wedding, which is how we got invited. There were hundreds of people there, before other random acquaintances started showing up for the night time dancing, and that was a “private” party. Even a “small” private party requires either hired help or lots of family members with spare time. The hosts are constantly running around refilling drinks, serving this, serving that, handing out the first round of party favors, cutting the cake, etc. etc. etc. There never seems to be a moment for them to sit with their guests, relax, chat, enjoy the party that they’re throwing. 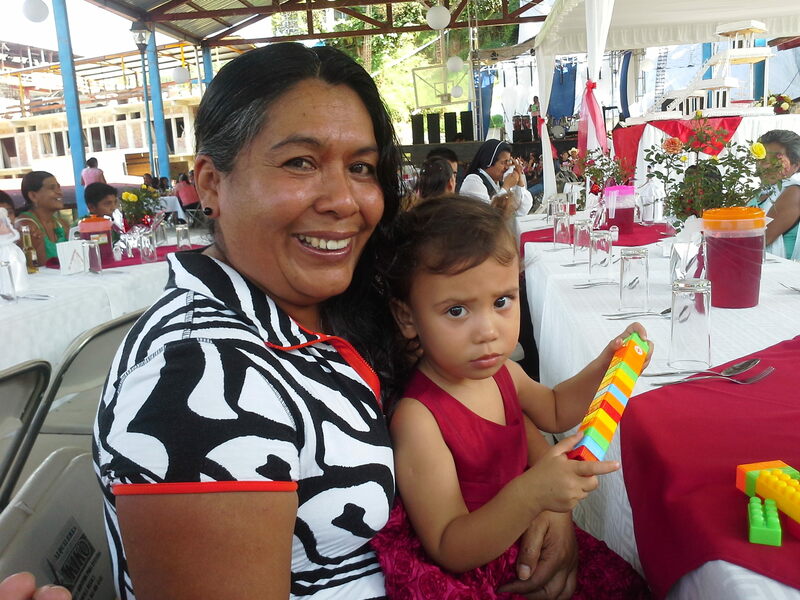 Lucia and her abuela at the wedding. Notice on the table there are pots of fresh flowers for people to take home and napkin holder things with the bride and groom’s names on them. In the background you can see their wedding cake, which is about 7 or 8 large cakes. Here you can see the barbie dolls in wedding dresses- another gift for the guests. Of course, people help pay for and do the work on these lavish parties, but still! It’s madness to me. Then there are public parties, something that’s produced every year for the whole town, but whose host changes yearly. This year we went to the celebration of the birth of Jesus (aka Christmas for serious Catholics) which our good friend Argelia’s family was hosting. When Arge was younger and suffering from lots of respiratory problems, aside from going to the doctor and also getting lots of home remedies, her mother made a promise to the Virgin that if Arge got better they would someday host this party (welcome to Mexican Catholicism). Something like this requires years of savings and months of preparation. At this particular celebration, over the course of two days there are hundreds of people in and out of the house, people that expect certain things- a dish of pozole (a kind of chicken and pork and corn soup) on the 23rd, tamales for brunch on the 24th, traditional ponche (fruit and cinnamon and cane sugar based punch, served warm)- the evening of the 24th, and much more. There are piñatas and other treats for the kids. There are multiple bands. Kids come and recite poetry about the birth of Jesus. There’s a play-like event related to the birth. There are multiple long masses at the church and long processions back up to the house. A week later there is more celebrating, taking the fake baby Jesus to the host family for the next year. “Please, let’s never throw a party like this,” I told Conan after we only got to talk to Arge for approximately 2 minutes. But I do desperately want a party- Kentucky-style, like in all those Old Louisville apartments I had, before we were parents. What I want is called a “convivio” here, a get-together (because geez, you wouldn’t want people expecting that giant kind of party). 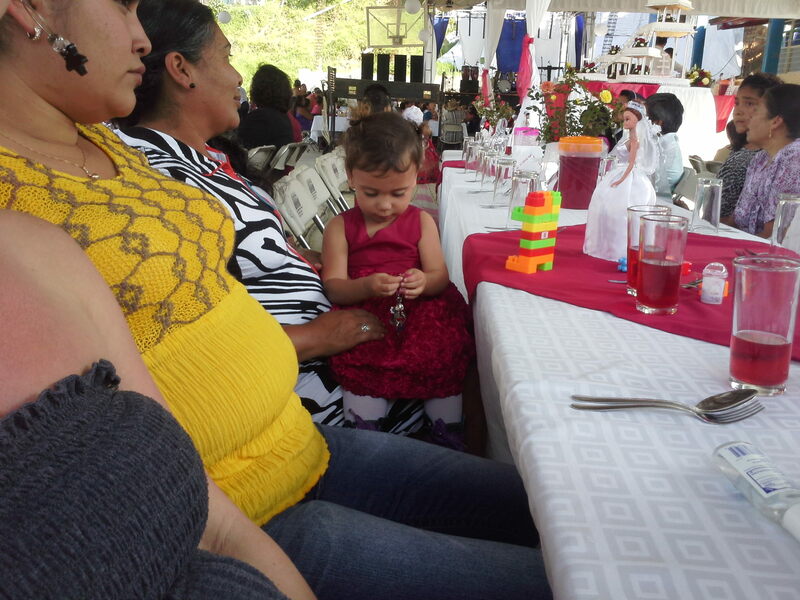 Our wedding, compared to most weddings around here, was a tiny convivio, although we invited 100 people. What I want is way smaller than our wedding. I want maybe 10 people, 20 at the most, to stop by our house, have a drink, play some cards, chat. I want to cook for people, but not have the food be elaborate nor be the main attraction. I want to play different kinds of music, so people feel like dancing, perhaps. I want to make a cocktail for someone. I want a reason for our whole house to be clean at once (instead of our usual, one room at a time). I want to sit out on the porch and laugh in good company. Maybe we can bust out the cards, too. I know it won’t be the same as when we were single folks in Kentucky. We’re not in Kentucky, we’re not single, and we’re not even the same as we used to be. But we have some friends here and some lovely acquaintances that we could potentially nurture into friendships. And we’re still fun (at least if I can stay awake)! And I’ve decided to make this a priority, a goal for this budding new year. Bringing this type of joy back into my life is surely a valid resolution. Even if it only happens once this year (twice would be better, though), I will have a get-together. Although it might not be the raging blast that some of our parties were in my early twenties, it’ll certainly be better than a resolution to lose weight! Happy New Year! May you find joy in many little moments throughout every day!